Outstanding home on a double lot (.89 acres) in a desirable school district. 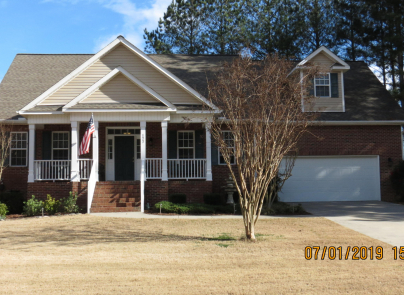 Split 3 BR plan with LARGE upstairs Bonus Room, and front & rear covered porches. Impressive tray ceilings and custom woodwork. Wide-plank, hand-scraped, hardwood floors flow from the Foyer, and run throughout the living space. Vaulted Living Room with lovely gas fireplace. Spacious Kitchen has fabulous granite tops, under-cabinet lighting and all appliances. Beautiful Master Suite with whirlpool tub, separate shower, dual vanities, private w/c and a terrific walk-in closet. Generous room sizes! Additional Features include: 3 Zone Rain Bird irrigation * dramatic exterior lighting * walk in attic storage * full guttering * Landscaped with lavender, peaches, blueberries, camellias, crepe myrtle & gardenia.